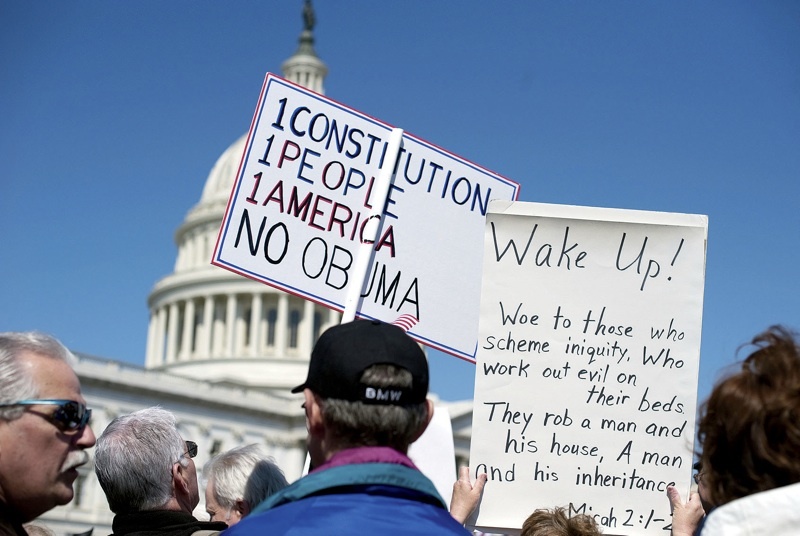 The Tea Party is a marvel of modern American politics. What began in February 2009 with a CNBC commentator’s tirade against federal support for borrowers with underwater home loans quickly built into a movement that altered the 2010 congressional elections and is now shaping the 2012 Republican presidential field. Local, grass-roots Tea Party activists are generally older than 45, mostly white, and “comfortably” middle class, Skocpol explains. “They’re often in their sixties and seventies, so they’ve had a chance to own a house and accumulate some savings.” National surveys indicate that men make up 55 percent of the Tea Party, but the authors observe that women tend to be more active in local groups, often leading them. Many Tea Partiers own small businesses, or did before they retired, says Williamson; they frequently describe themselves as “proud capitalists” who have worked hard all their lives. And despite their reputation for despising government programs, Skocpol reports that many grass-roots members “are not only collecting benefits from Social Security, Medicare, and veteran programs, but also think these are good programs that are legitimate. Grass-roots Tea Partiers make a real distinction between things that go to people like themselves, who have earned them, and the kinds of government spending…that [go] to low-income people or young people or immigrants,” whom they see as undeserving freeloaders. But the Tea Party is more than these grass-roots activists. Skocpol and Williamson include in the movement conservative media outlets, such as Fox News, and an elite group of big Republican donors and well-funded free-market advocacy organizations, such as Americans for Prosperity, co-founded by billionaire David H. Koch. These parts “sometimes work at cross purposes and sometimes work together,” Skocpol explains. Thus grass-roots members may support Social Security, while the advocacy groups seek to radically restructure social programs. Skocpol says such groups associated themselves with the Tea Party to capitalize on the grass-roots enthusiasm, but promote their own agendas. She is skeptical of the parallels often drawn between the Tea Party and Occupy Wall Street protests, in part because the Occupy protestors have yet to articulate clear goals. “A lot of Americans are pretty pissed off right now,” she says. “You could say that these two protests have that in common, but I don’t know that they have much else.” She also notes a “startling” generational difference: Occupy Wall Street is made up mostly of young adults, while the Tea Party consists overwhelmingly of older adults who tend to distrust young people, particularly those without jobs. Editor’s note: Theda Skocpol is an incorporator of this magazine.